Football is such a political game in Australia that sometimes, supporters forget to stop and smell the roses. Tonight, they will be in full bloom. The FFA Cup begins this evening with four games in four cities. Eight teams, semi-professional at best, full of players you’ve never heard of, battling it out at very humble grounds in front of very modest crowds. And it’s on TV. This is glorious. Think, for a moment, about the magnitude of this achievement. It has taken nearly 10 years for the A-League to carve out a proper niche in the Australian sporting landscape. Crowd numbers at NPL games rarely nudge past triple figures. For those divisions below the top tier, it’s usually only family and friends watching on. If you’re lucky. The FFA Cup shouldn’t be a feasible venture. The Australia Cup wasn’t, and nor was its sorta-successor, the NSL Cup. When you consider just what it takes to convince an Australian sports fan in 2014 to leave the comfort of their home and open their wallets, this is anti-trend. Modern sport is about superstar names, flamboyance and non-stop adrenaline. It is the Big Bash League or the A-League All Stars. Not a self-proclaimed pub team taking on another club you’ve never heard of somewhere in suburban Melbourne on an unsexy Tuesday night. If Vince Gilligan had a tough time pitching the premise of Breaking Bad to television executives, it’s a wonder how the FFA convinced sponsors to part with enough money to get this crazy idea off the ground. Indeed, few would envy those charged with the task of putting this thing together – if it was easy, it would have been done years ago. But it isn’t, and it wasn’t. Until now. And now all there is left to do is strap yourself in and enjoy the ride. It’s not perfect – then again, few things are the first time. Some clubs, such as Adelaide City, aren’t able to play their home games at their true home grounds, which is a shame. More of a shame is the fact that the reasons why aren’t quite clear, but that sort of thing is par for the course from FFA. For a competition that is all about the Dencorub-scented romance of the grassroots, concessions – or investments – should be made to bring those venues up to the required standard. Meanwhile, Melbourne City have been allowed to take their clash against Sydney FC to Ballarat. That’s good news for the people of regional Victoria, who should soak in this rare treat, but bad news for the noisy few who consider the move a sign the FFA Cup isn’t being taken seriously enough by A-League clubs. The National Club Identity Policy, launched on the eve of the FFA Cup draw, has cast a dark pall over the tournament for the ethnic-backed clubs – particularly those formerly of the NSL – who feel their identity has come under renewed threat. The de-wogging of Australian football has been an ongoing issue for decades and it is clearly a long way from resolution. But when the referee blows for kick-off in each cup tie, those tensions will wash away for just a little while, and the therapeutic nature of football will take hold. 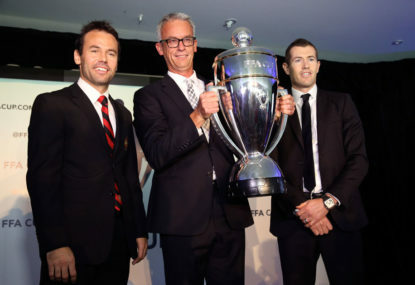 Some have claimed promotion of the FFA Cup has been lacking. But has it? Sure, the average Joe will probably need a second explanation of what it is and why it matters for him to flick past the other two Fox Sports channels and start caring. But those that matter already know. The truth is it wouldn’t make sense to pour the little money the FFA has into a mass marketing campaign for a tournament that isn’t meant to be a huge earner, and realistically won’t enter the wider national consciousness until the final rounds. Instead, community and regional newspapers have taken up the slack and engaged with the FFA Cup’s true target audience, reinforcing the significance of what is about to unfold. For now, this is for them. This is for the kit man, the ladies in the canteen, the guy who gives up two or three nights a week to coach the juniors for no reward. This is for the players who still dream of making the big time and for those who struggle to run for 90 minutes. The only missing ingredient is the essence of cup football – the magic. And it’s coming. On the balance of probabilities, it has to. At least one amazing, unpredictable storyline will unfold and capture the hearts of football fanatics across the country at some point before the FFA Cup final on December 16. That’s all FFA will need for this competition to work. Once it happens, word will spread like wildfire, and as they say in the classics, the rest will take care of itself. So it’s over to the forgotten clubs of yesteryear, the new kids on the block, the weekend warriors and the rusty professionals in the throes of pre-season. Do your thing.